Irina Claw Clip ~ What if one day you had short hair, and the next long? No scissors required. A wig may help accomplish this feat, but with the Irina we took it one step further. An easily attached hairpiece can be reversed to give you either 11 inch long hair, or 16 inch long hair. The decision is yours everyday when you own the Irina. The long beautiful fibers of hair can be styled however you need them to look by adding some hairspray. Place the hair up, let it fall down, or give it some volume. 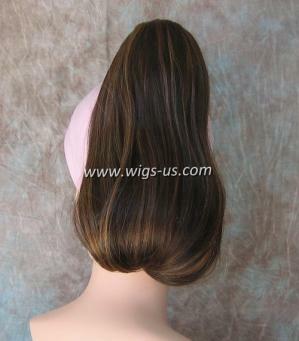 You can treat the Irina hairpiece like you would your very own hair. It also blends in very well with your current overall look. With all the colors we have available to choose from, you are sure to find the one that best matches your very own hair color. The synthetic fibers are so soft, and are built with high quality materials. You can expect to wear this hairpiece over and over again with no problems. At a great price like this we probably won't be able to keep this popular seller in stock for long. Get your Irina hairpiece today while you can.